I decided that Ethan needs a new quilt for his new cabin berth, but time is short, so I asked Barb to help me design and put it together. Yesterday was our work day at her house, and we were able to finish the sailboat blocks. 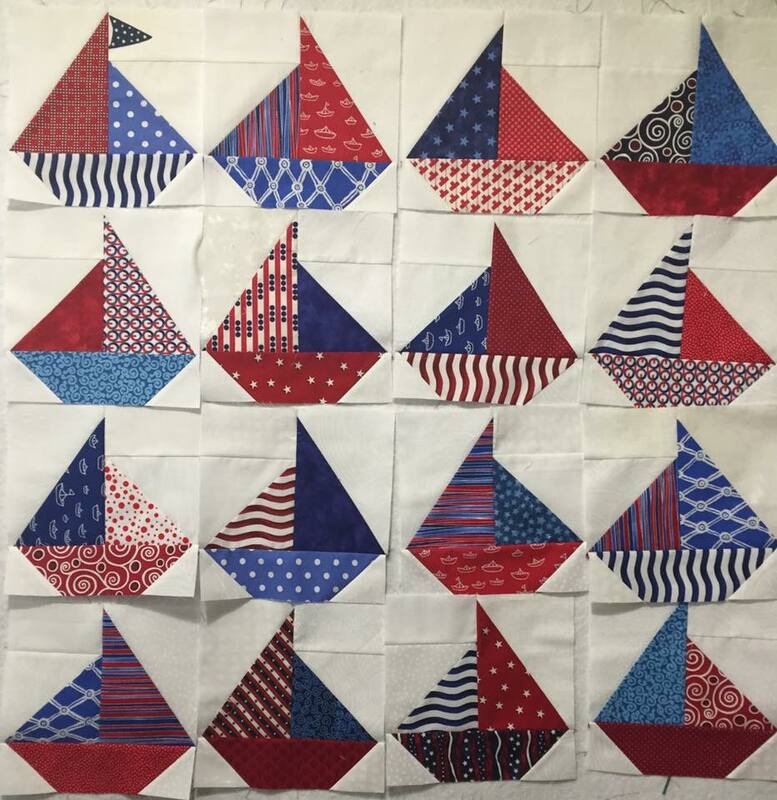 Of course, there is more work to do on this scrappy, red, white and blue quilt, so I will work on it whenever I can get a free minute. 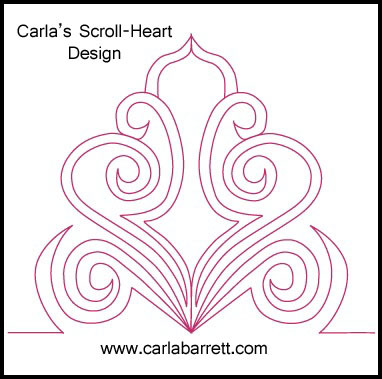 Hello, I thought I would give you a sneak peek into how I come up with designs that I plan to turn into machine quilting designs on my Tablet PC. I open Photoshop Elements and create a new document. I just start sketching freehand style and erase any designs that seem not to work. I do not worry about the lines if they are wobbly at this point, since I know I will redraw and edit lines later on in this digital format. If I am designing a small wholecloth design, often I will just draw a section of the quilt, then copy, paste and flip to make a square shape. I love to work digitally. Now it is time to redraw and edit the design. I know that the center is rather boring, so will adjust that. I will also edit some other lines, too. Sometimes, I will redraw a design multiple times, until it flows for me. At this point, I can edit further, or pull out individual elements that could make nice simpler designs all on their own. 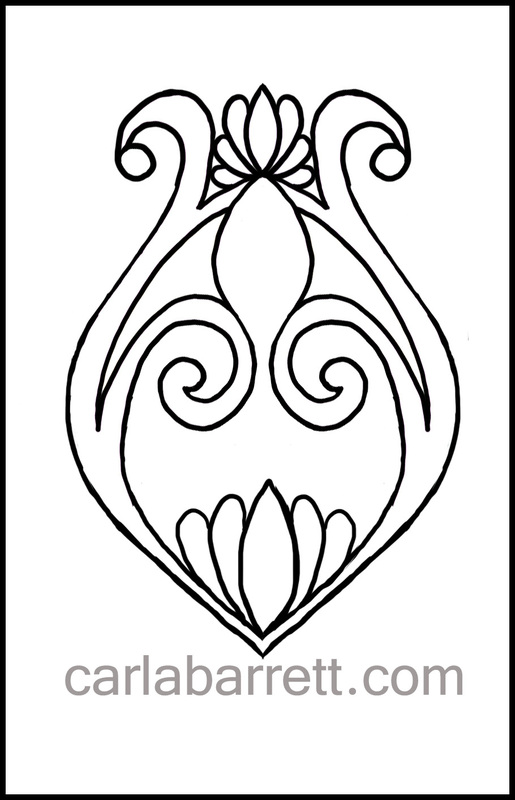 These designs can later become part of a larger set of designs. Anyhow, this gives you a general idea for how I work. 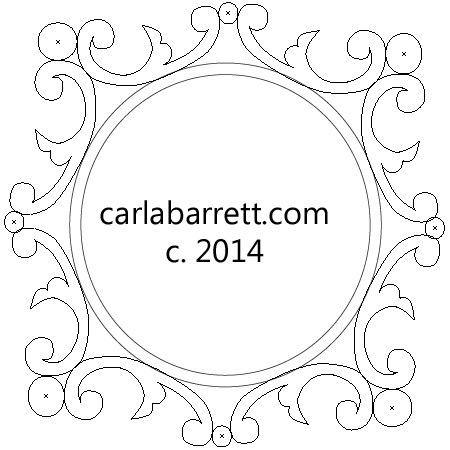 I plan to redraw these designs and fine tune the stitch path for commercial application. As mentioned in my last post, it was time to buy a new tablet, so I decided to follow my own advice and pick up a brand new, yet discontinued, tablet PC for a fraction of the price. The model I selected was offered on a reputable website, but would save me quite a bit of money in the end. I needed a new Tablet PC to run all my design software, like Photoshop Elements, Illustrator, and Art & Stitch. The model I purchased was a Lenovo Thinkpad x230, which I purchased from B&H Photo brand new for only between $600-659. It is currently offered now for $634 US here. I want to let blog readers know my first impressions and how my purchase has worked out so far. The package shipped promptly from B&H, and arrived just fine in a brand new box. This was indeed a brand new machine and not a refurbished one. I opened the box and then proceeded to set up my machine and install all my software. This notebook does not have a CD/DVD player, but I just used my portable one that connects to the computer with a USB plug to install all my software. Once I had Photoshop Elements 13 installed, it was time to try it out. Sure enough, it worked perfectly! 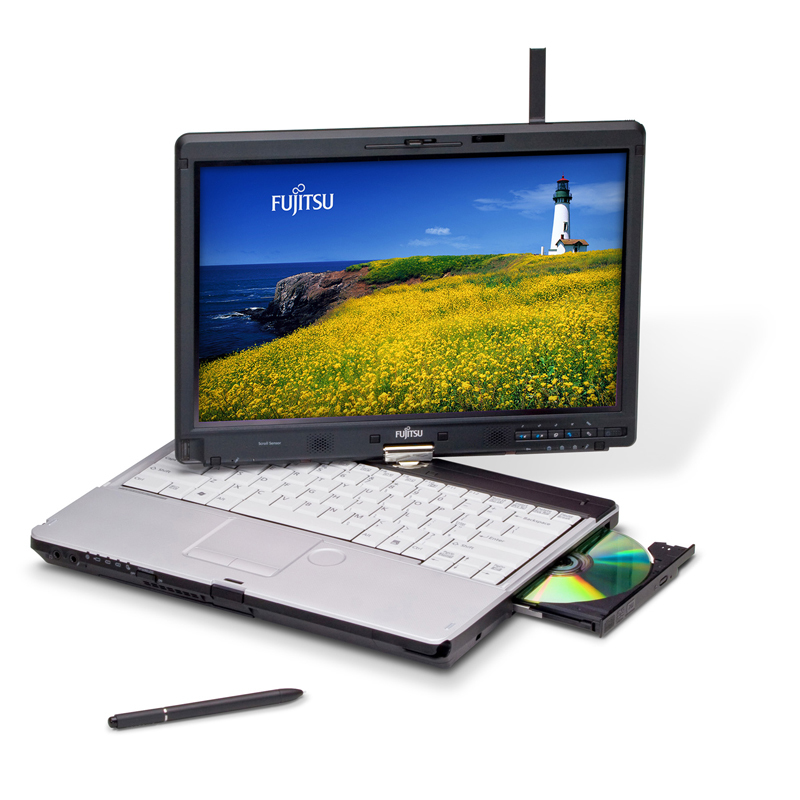 It has similar specs to my last Tablet PC, the Fujitsu T902, but I paid less than 1/3rd the cost. 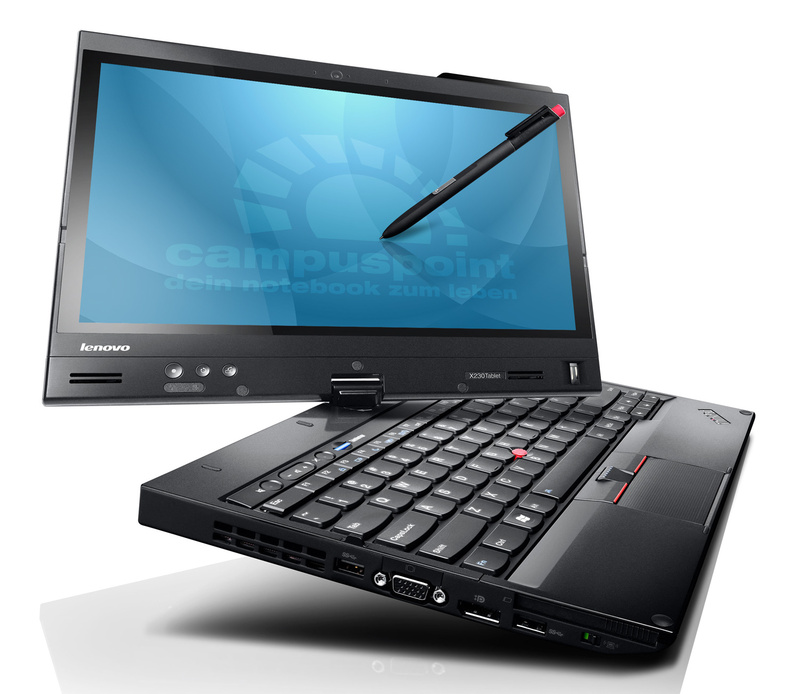 The pros: Lenovo x230 is a fine tablet and comes highly rated by other artists. The price was right. Tablet works as advertised. The cons: The keyboard set up takes some getting used to, but I added a mouse for ease of web surfing and clicking. The Wacom digitizer and pen are a bit different than previous Tablet PCs, it seems to have some pressure functionality. It will take some time to get used to the new set up. This machine was released a few years ago, and is now discontinued. All in all, I am very happy with my new tablet, and love that I spent less than $660 US. I think this is an excellent value for what you get. I can now start drawing and designing once again! 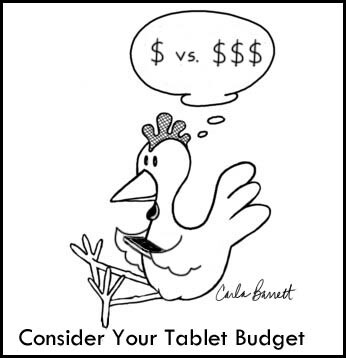 This post is for all the students and blog readers who write me about wanting a Tablet PC. As mentioned in my post (seen below) my current Tablet PC, a very pricey Fujitsu T902 purchased about 3 years ago for about $2000 US, had the power cord disconnect. It was not very robust a machine, as the cracks on the case reveal. I decided it was time to get a new Tablet PC, so I started my research. T o date, over the last 10 years, I have owned 3 Tablet PC Convertibles, which means they act as either a PC laptop or notebook, and also have tablet functionality to allow me to draw on the Wacom digitizer monitor screen for art purposes. My first one was the best, a Toshiba Portege, however, Toshiba stopped making Tablet PC Convertibles awhile back. My second tablet PC was an HP Touchsmart tm2, but it never lived up to my Toshiba Portege. It finally bit the dust during my AU trip and has been long discontinued. I then purchased the Fujitsu T902, however, it is now out of action due to Ethan tripping over my power cord and disconnecting it. I plan to get this repaired so the Fujitsu becomes my backup Tablet PC. The last few years have seen rapid changes in the Tablet industry, and is very confusing to most people, even tech savvy readers. I knew I wanted a Tablet PC, with enough system memory so it would run my favorite design/drawing programs like Photoshop Elements, Adobe Illustrator, and Art&Stitch digitizing software. The digitizer needs to be by Wacom, mainly due to the better performance and precision. This ruled out buying Microsoft’s Surface Pro 3, which instead has a digitizer called N-Trig. I also wanted an Intel Processor, and my Operating System (OS) could be anything between 7-8.1, since Windows 10 isn’t out yet. I looked at all the current offerings, and trust me, there wasn’t all that many offerings which met my art and design needs. I could have spent anywhere between $1-3K, but then decided to try something that I recommend to students in my Tablet Design classes. That is to buy a slightly older, discontinued, highly rated,Tablet Convertible PC for a fraction of the original price. So I went for it!! The Tablet PC Convertible I bought has all the specs that my Fujitsu T902 had, but instead is a fraction of the price at $659 US. I purchased a new, discontinued Lenovo Thinkpad x230. Since I bought it from a reputable retailer, if I do not like it, I can easily return it. Home now after 3 trips in 3 months! October, I was in Australia. Went sailing in November in the British Virgin Islands. December was spent spending quality holiday time with my Dad and Doris in Missouri. I am a bit traveled out, I do say! In the meantime, the power cord on my Fujitsu tablet PC was detached by accident by a cute little boy named Ethan. That means for the first time in over 10 years, I am without a tablet. Do I hear a gasp? 🙂 So now I am on the hunt for a replacement tablet PC, and I need to have my Fujitsu repaired, too. Promise to write a post about my research for those interested in this subject once I look at all current offerings. 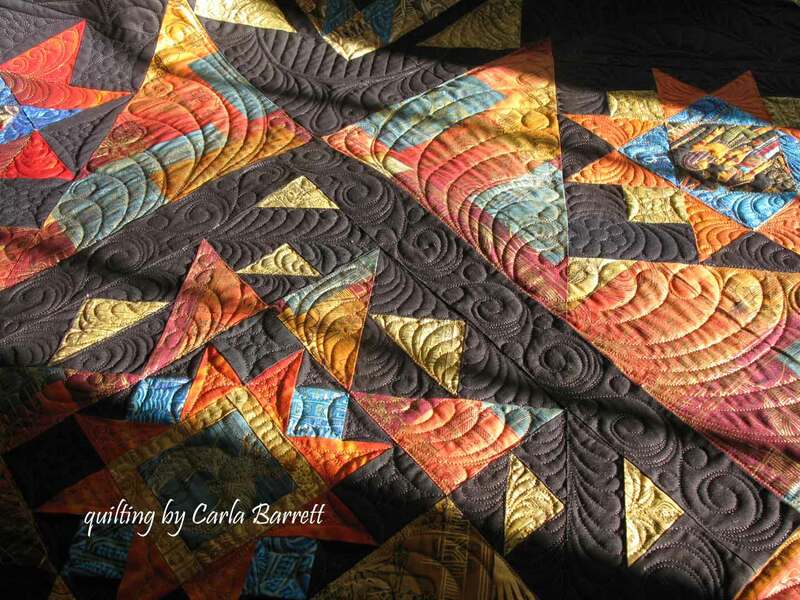 Once my Tablet PC is replaced, I plan to announce another Quilt Whisper design class. I may even hold a brand new class, too. Stay tuned as I will announce it here, on FaceBook, and through my mailing list. If you are not one my mailing list, please write a comment indicating you wish to be added. I promise to never share your email with anyone AND will not send out junk mail to you. 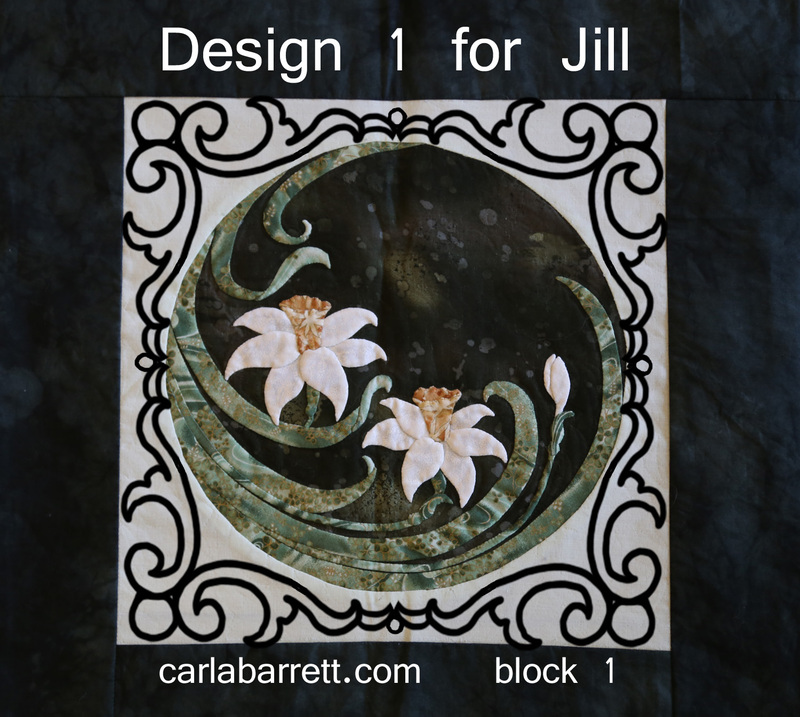 Thought I would begin a new series on designing quilts for machine quilters, so let’s start with a lovely applique quilt by my friend, Jill. 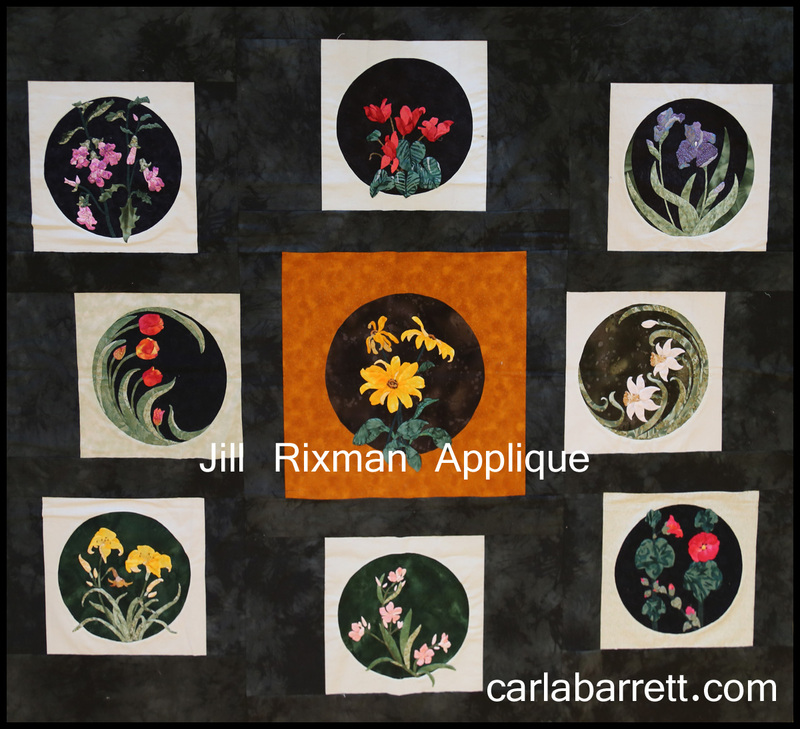 Jill Rixman, the owner/teacher of the applique pattern business called Artfully Applique, is truly a master applique artist. She needed a quilt to showcase patterns for sell in her booth at quilt shows, so she brought her quilt to me. 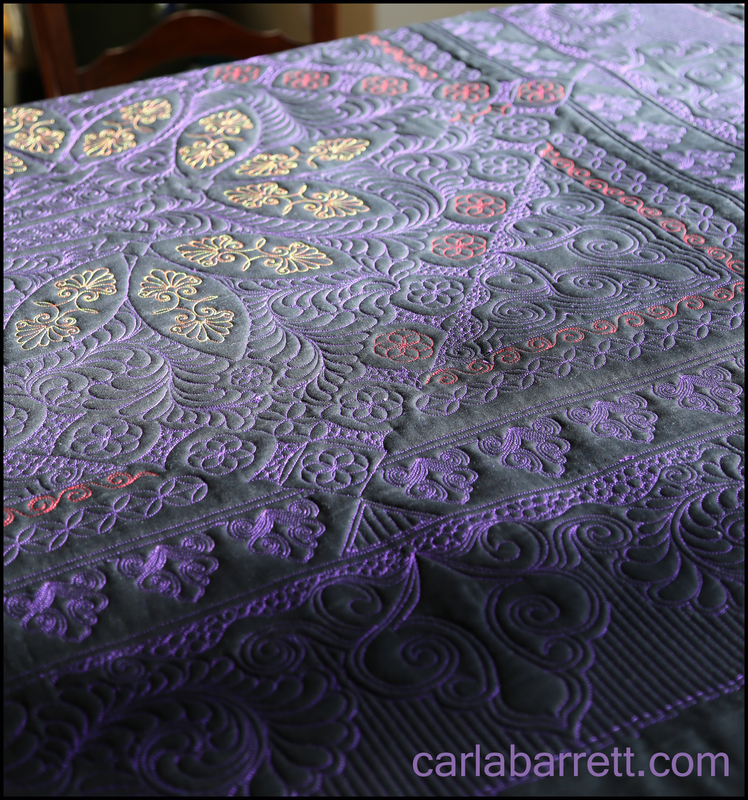 When I first started quilting over 10 years ago, Jill came to me with the first quilt that I quilted for her. That quilt still hangs in her booth, receives many compliments for her and apparently, sells many patterns. 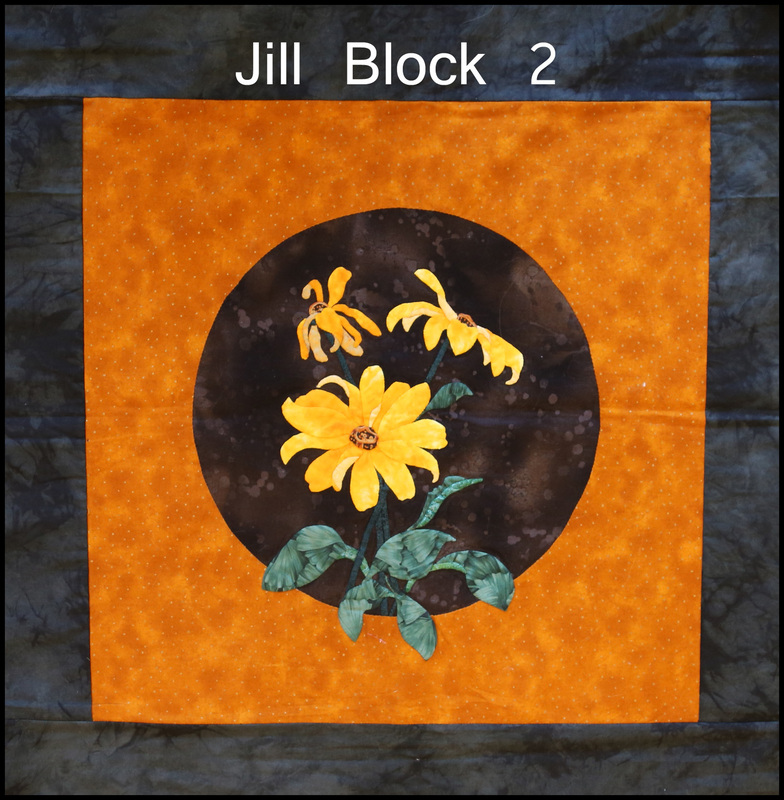 As a machine quilter, the first topic to consider is the purpose of the quilt- which in this instance is to sell Jill’s applique patterns. In keeping with my 2014 goal of drawing (and then digitizing) custom designs for every quilt I work on, I first needed to divide up the quilt into distinct design spaces. For Jill’s quilt, this was simple. 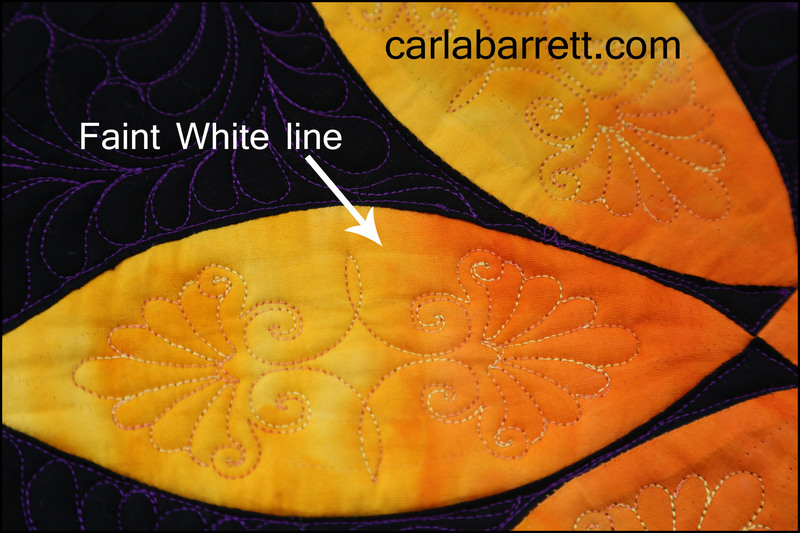 You have 2 sizes of applique blocks, the inner circle and the negative space between the circle and block. Then you have the background fabric space, which will be further divided for interest and to draw the eye inward towards the center. 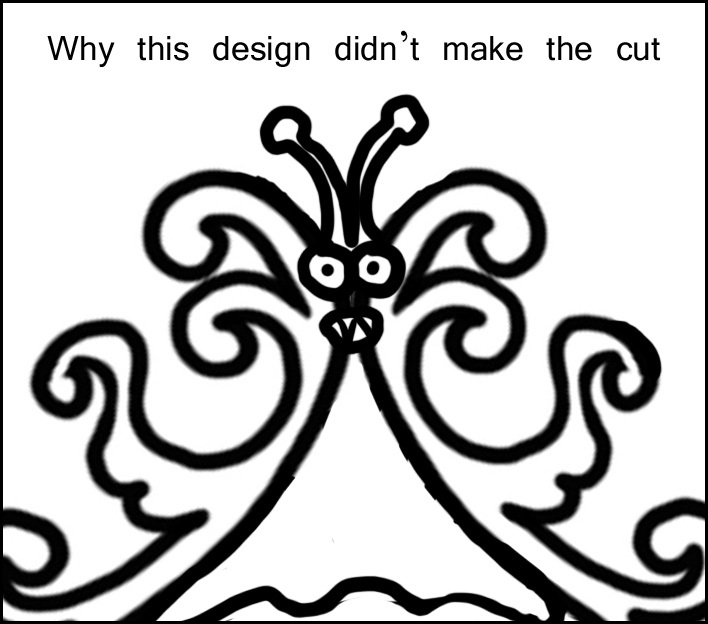 Since this is my main design, all the other designs in the quilt will relate to this design to ensure quilting design cohesion. 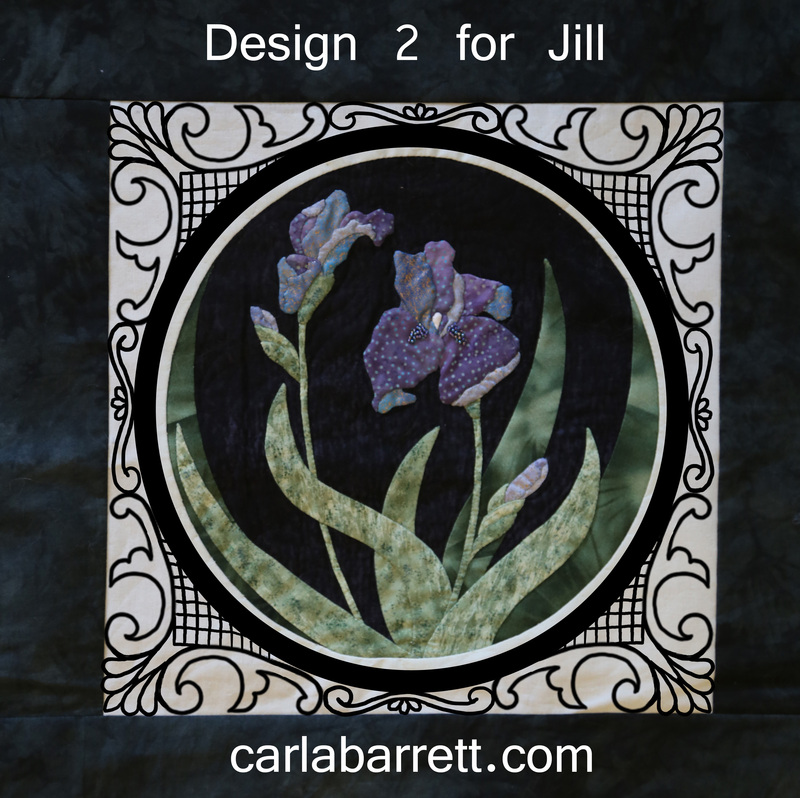 Jill has chosen my circular fill for the inside of each circle and around the applique. I gave Jill several fill options and this is the one she prefers. Let’s move onto the small applique block design now. Notice that both designs frame the applique circles. By choosing to quilt frame designs in the block, this showcases the importance of the applique work. I will also pick a thread color that will blend into the lighter spaces. This is because I do not want the quilting to compete with the applique work, instead, I want the quilting to complement. Obviously, I will also stitch in the ditch the blocks. Let’s talk about the proposed background design. To draw the eye inward towards the center, I will add some linear ray lines with freeform fill. This will provide some nice texture in the background. 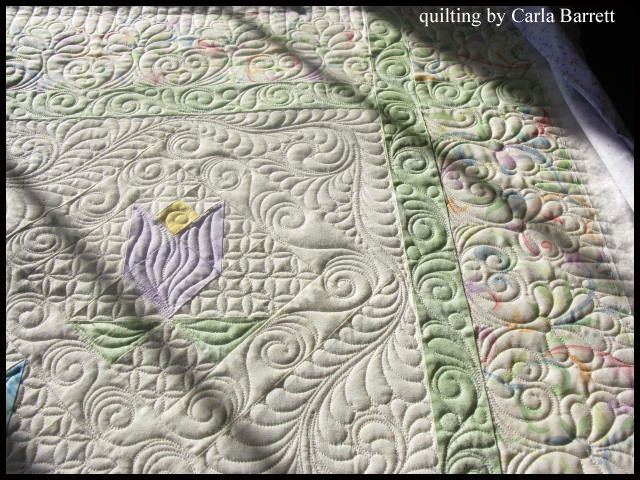 Plus I can also add small motifs into the freeform quilting, including butterflies, flowers, leaves etc. along the quilt’s theme. Once again, I will pick thread that matches the background fabric, I want to provide interest and texture, not compete with the block applique and piecing. My frame designs are actually rather clean and simple. 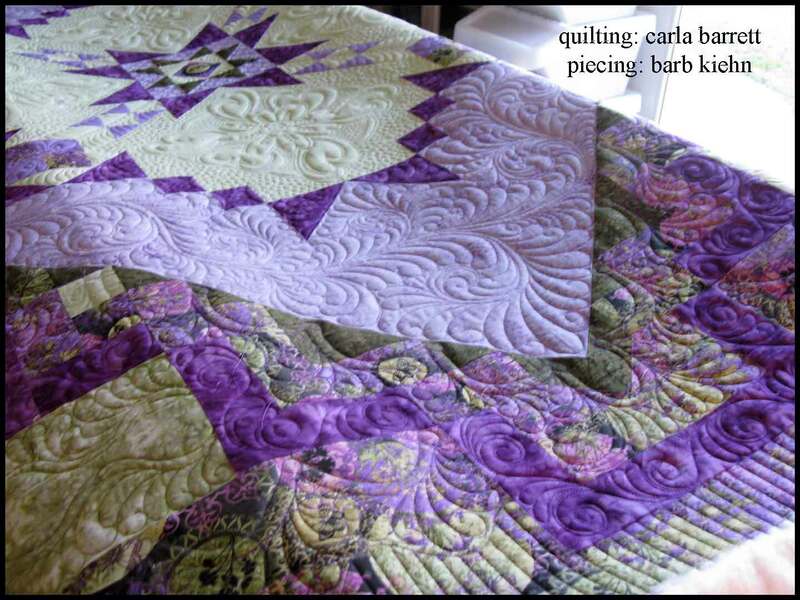 The reason for this relates to the owner’s quilting design preference. Jill does not like too much quilting, so I wanted to respect this. Here are a few sketch designs which did not make the cut, including my favorite one on the left I think Jill would like this design if I removed the cross-hatching fill in detail. 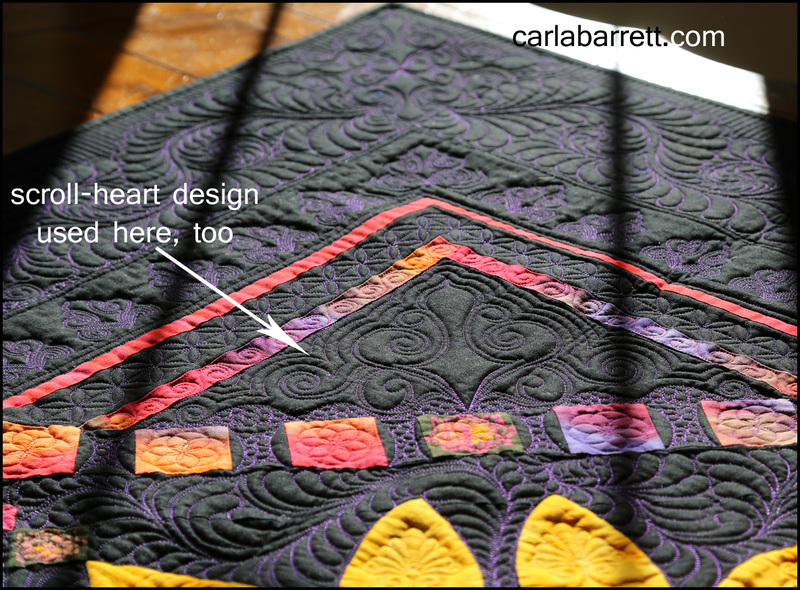 This gives you an idea for how I design for a quilt- and my thought process as I get ready to quilt it. I have Jill’s quilt loaded, and will start it after Thanksgiving. Let me know if you have any questions. Just leave me a comment and I will write back. Around the World Blog Hop- My Turn! 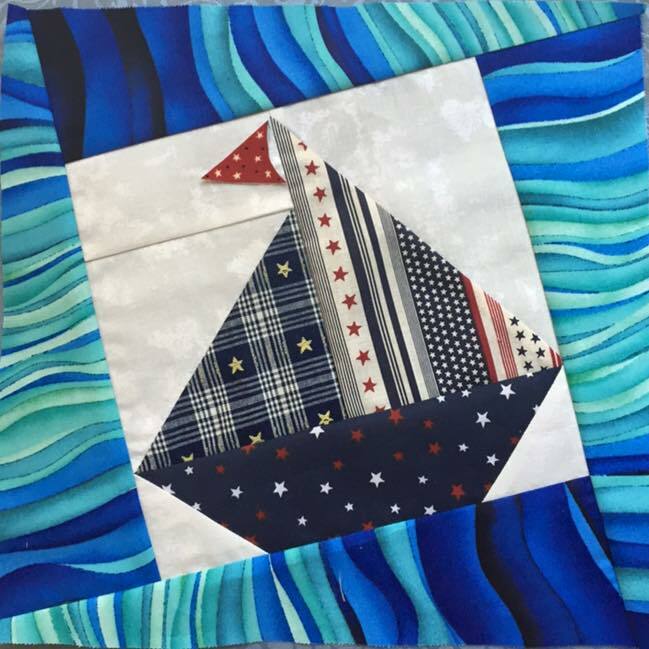 I was invited to participate in the Around the World Blog Hop by two amazing fiber, art quilt and digital artists, The Pixeladies, also known individually as Deb Cashatt and Kris Sazaki. Years ago, I was asked to do the quilting on one of their art quilt projects, and through this collaboration, we became friends. Recently, I visited their studio and got to see all their stunning works in progress. If you are unfamiliar with their incredible work, and art quilts created with fabric text, click now to visit their gallery page. 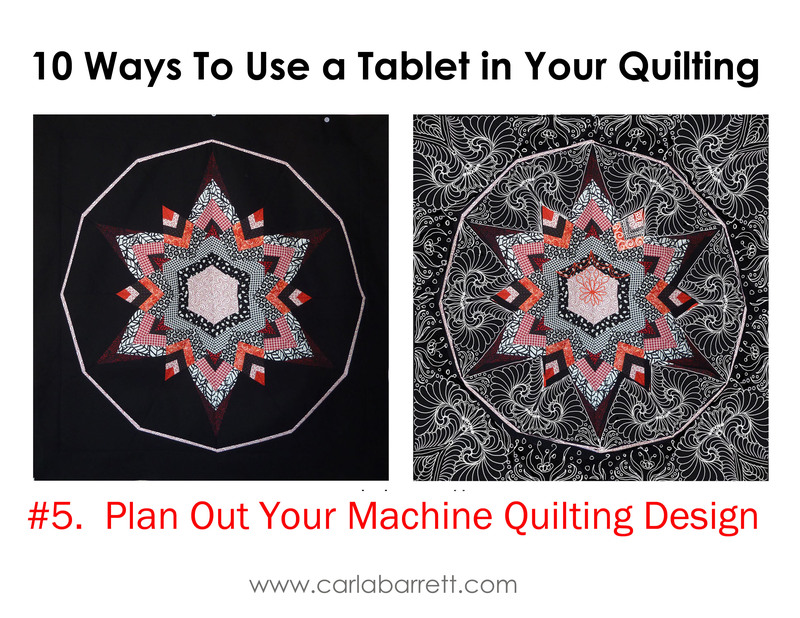 Machine Quilting- I recently borrowed back the above quilt (previously quilted a few months ago, titled Bold Beauty), to share with students in Australia. The picture above shows you the back of the quilt. 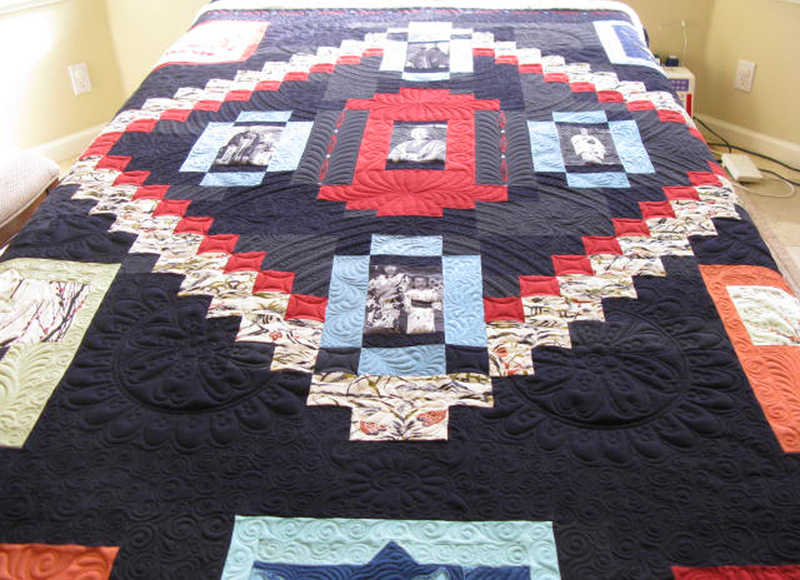 This quilt has won many awards in Montana for the owner, Teddie Egeline, including Best of Show and Judges Choice at the Montana State Fair. Anyway, while in AU, I noticed a couple of places that need fixing, specifically, color repair of some white marking pen oops previously discussed in a post here. I realized that to be more archival, I should have heat set the repair. So now I will go back over the lines with several shades of Inktense pigment pencils and once dry, heat set them. After this repair, I plan to work on 2 quilts- one by applique artist Jill Rixman, and also one by my friend, Doug Hodder. Freeform Beading and Freeform Crochet- Currently, I have two different projects in progress, though both are freeform. 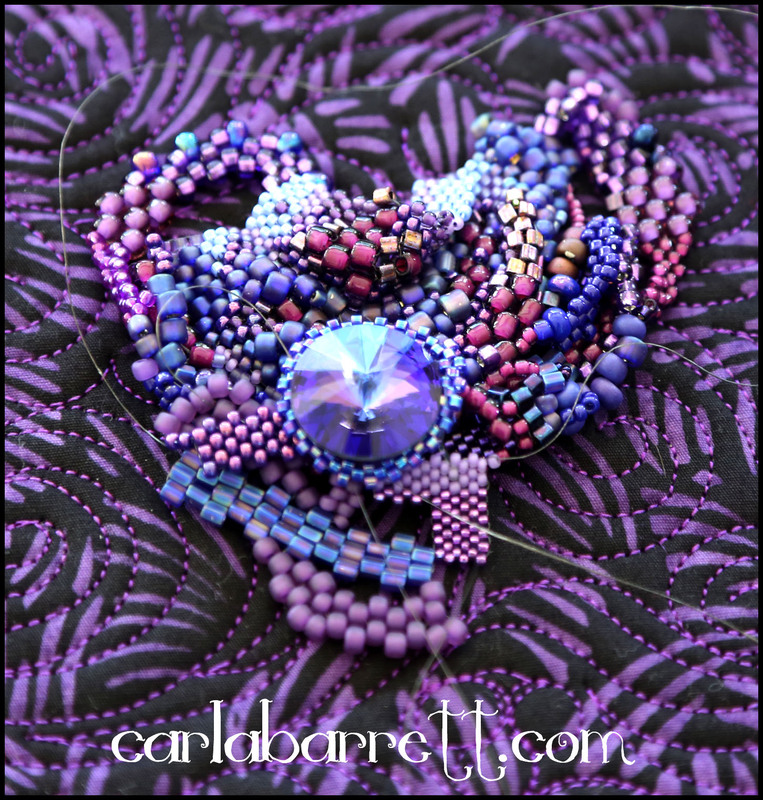 The first one is a freeform beaded purse, so I am working on the freeform peyote embellishment. I have just started to bead a 18mm Swarovski crystal, which will be a focal point element of this project. My color palette is magenta, purple and blue. My current freeform crochet project is a bit different from my usual freeform crochet work. 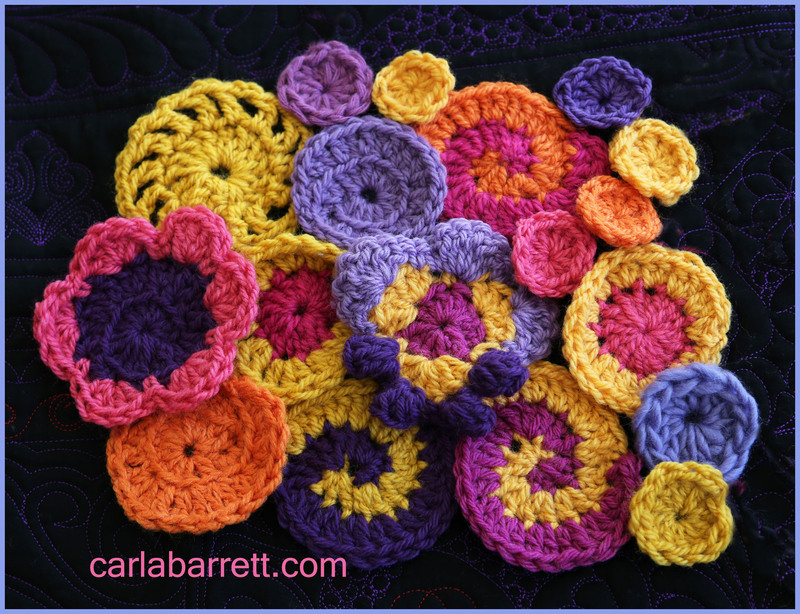 I like the combination of my random freeform combined with some more traditional freeform scrumbles, so I decided to take a Craftsy Freeform Crochet class with the talented Myra Wood to learn her process. Below is a picture of my class homework so far. These are “scrumbles” in progress as I learn her technique. How does your work differ from others of its genre? 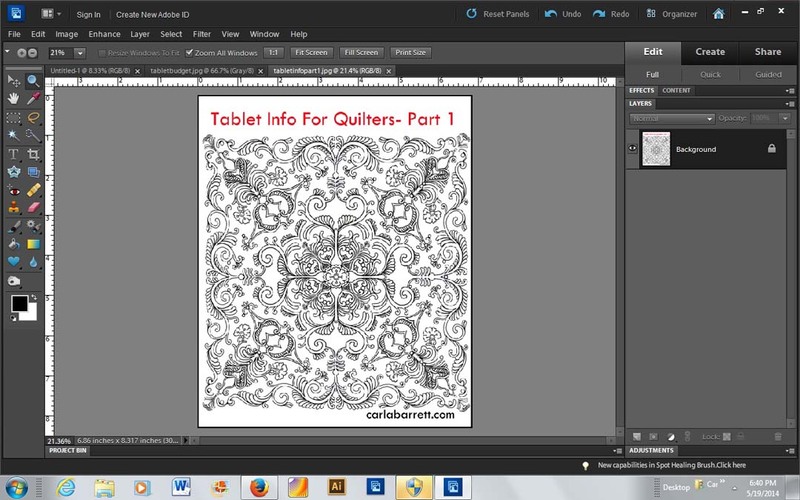 With regards to my machine quilting work, I plan out my quilting lines using a Tablet PC laptop in Photoshop Elements. This allows me ease of editing and planning, communicating effectively with collaborators, as well as provide me with a road map to follow during the quilting process. 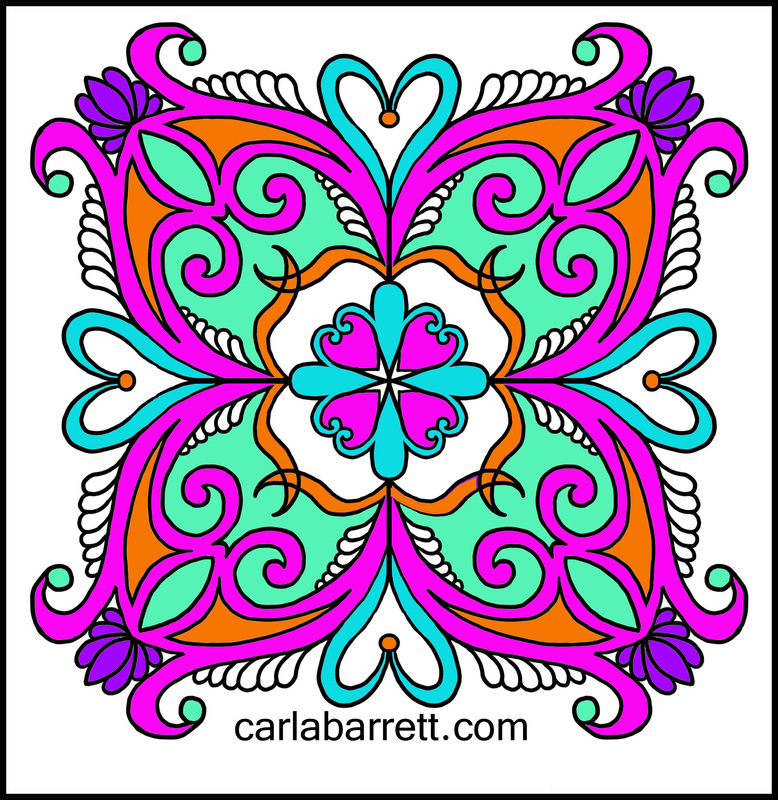 I also will design a special motif, border or fill to use on each quilt using a digitizing software called Art & Stitch. 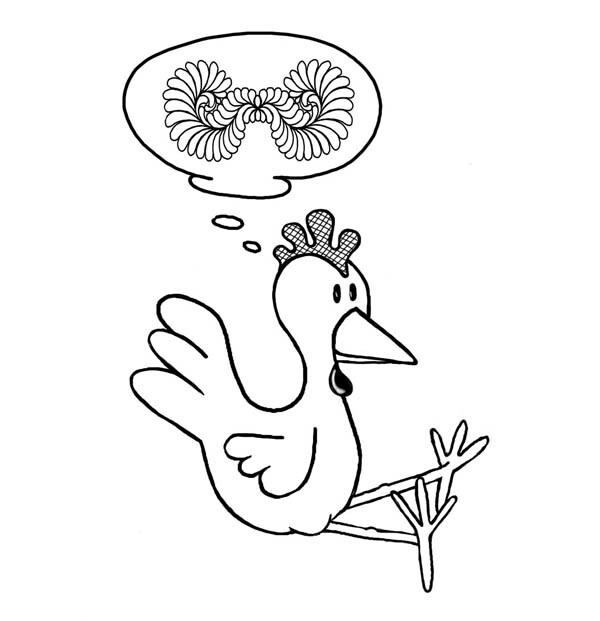 I also will use my tablet to draw a quilting cartoon from time to time, too. See more what you can do with a Tablet in this post here. First, I draw with my stylist on my Tablet PC monitor in Photoshop Elements. 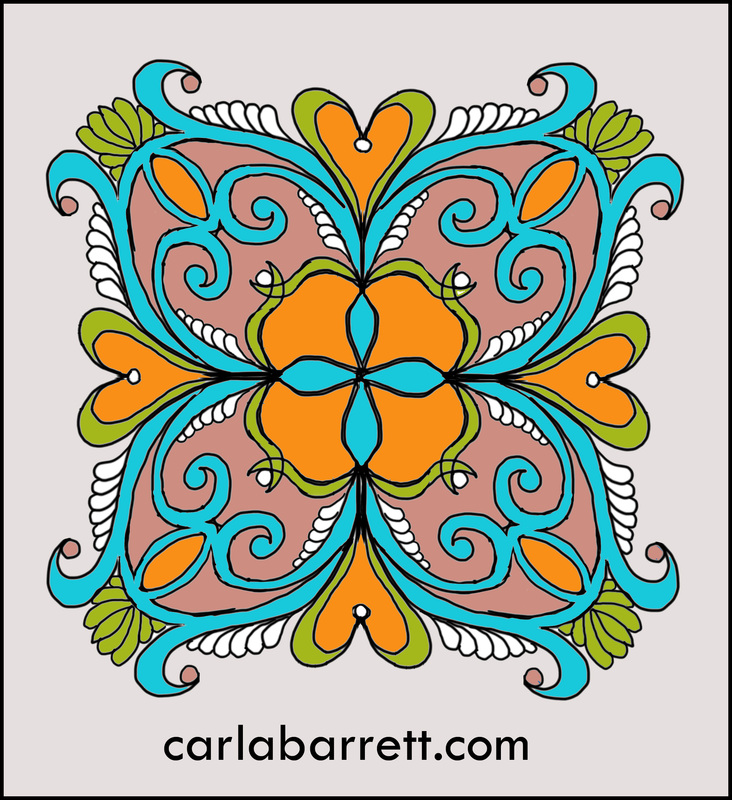 Once I like the design, I will import my design into Adobe Illustrator and Art&Stitch digitizing software, converting the artwork from a raster drawing to vector artwork. On the left is a custom design drawn for Teddie Egeline’s quilt, Bold Beauty. This is a screenshot taken of the finished vector art. If you have any questions about my process, I would be happy to answer them. Just leave your question in a comment, below. If you would like to know more about buying a Tablet, I do have a 4 part series on purchasing a Tablet for artwork here. 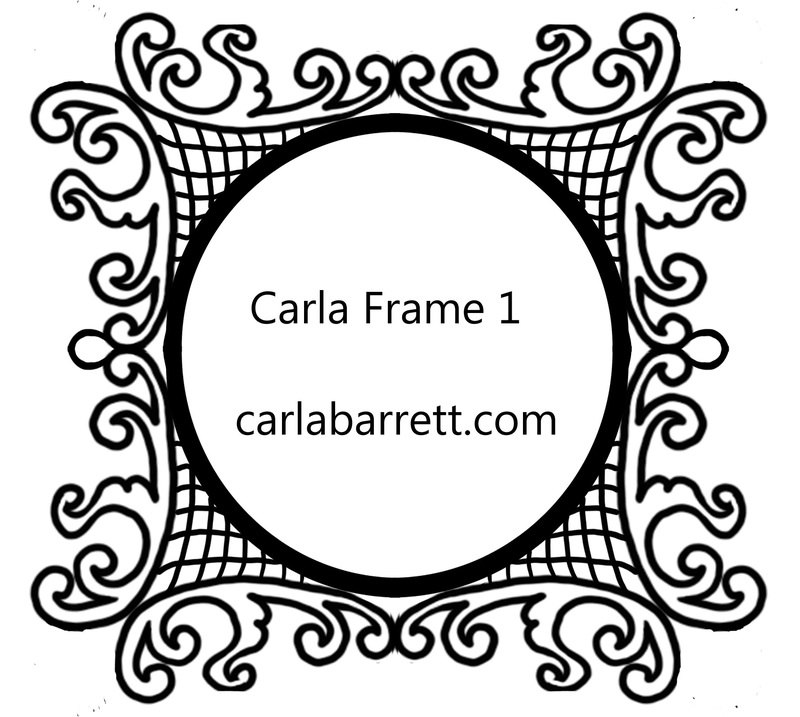 If you would like to know more about working and creating with Art & Stitch software, please see this post. Judi Madsen, quilting artist, author, teacher and designer. During my teaching trip to AU earlier this month, I met Judi a couple of times as my class was ending and hers was due to begin. 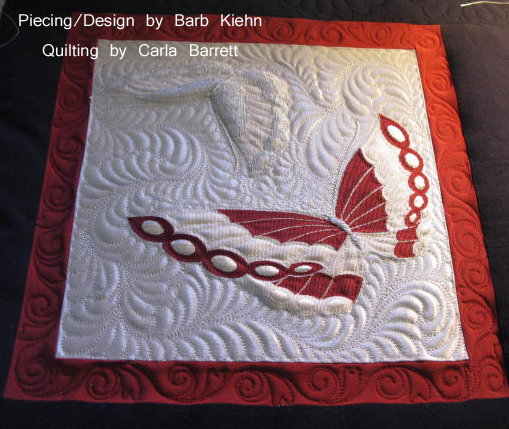 Her freehand machine quilting work is young, vibrant, and has a modern vibe. 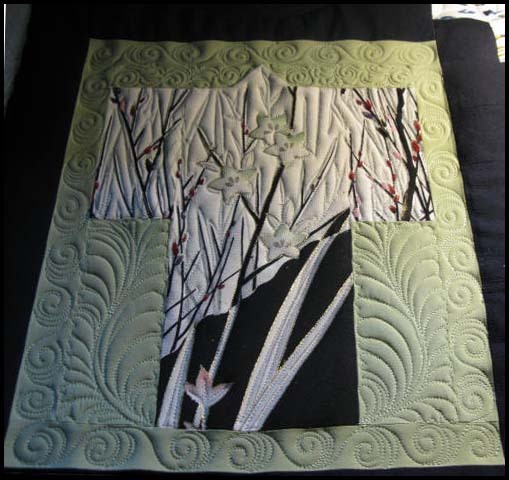 Be sure to visit Green Fairy Quilts blog to see Judi’s stunning work.